This depot was built in 1878 by the Chicago-Milwaukee and St. Paul Railroad on the branch line from Mason City, Iowa to Austin, Minnesota and was in use until October 1974. The Grafton Community Action organization purchased the depot in December 1974. The next year, the depot was declared a Bicentennial project by the Iowa American Revolution Bicentennial Committee. 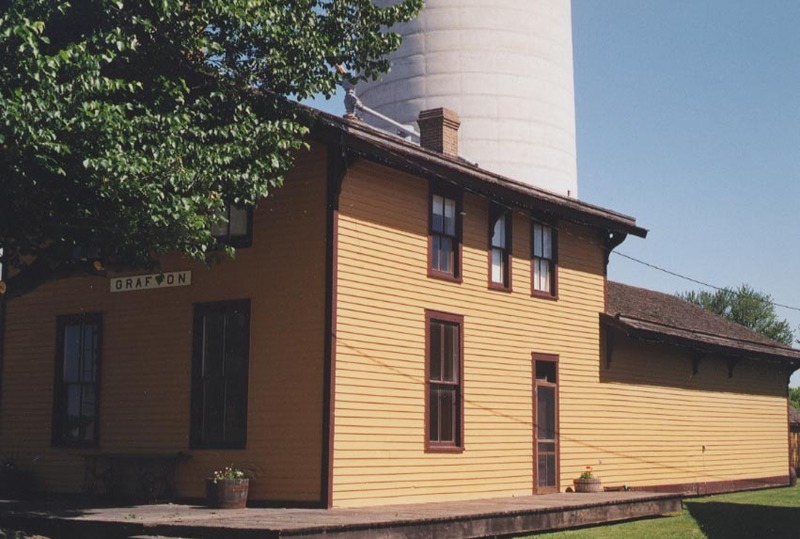 In June 1976, the depot was placed on the National Register of Historic Places and now is being used as a railroad museum and local heritage center. The Depot is open only by appointment. Location: Downtown Grafton, Iowa.at the west end of Central Ave (Hwy. 105) at 4th St.
Tours: Contact Connie Bruesewitz at 641-748-2337 to make arrangements for a guided tour, preferably during the week. School children and Scouts are welcome.